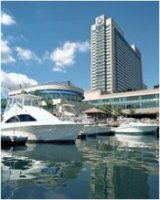 This casino guide provides reviews that will help you find, locate and learn about the 12 casino resorts in Atlantic City with information on Hotel Room Discounts, Atlantic City Shows, Stay-and-Play Packages, entertainment and hotel spas. This gambling locator also describes the four horse tracks located in New Jersey. 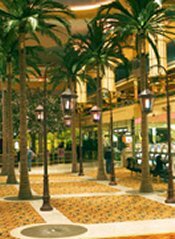 Atlantic City casinos offer all gambling games including slots, blackjack, table games, craps and poker. The first Atlantic City casino was Resorts International, which opened in 1978 to a standing room only crowd. Now there are a total of 12 gambling facilities. 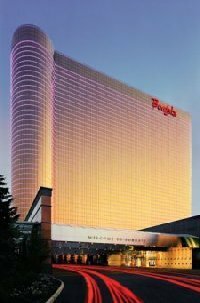 Some of the popular places are Borgata Atlantic City, Atlantic City Harrahs and Trump Plaza Hotel. The newest casino is the Revel Resort, picture shown. All casinos are open 24 hours and the legal gambling age is 21. Transportation from the airport to the boardwalk is $27 for a taxi or $60 - $70 per day for a rental car. Parking at a casino is $3 - $5 for a 24 hour period. No RV overnight parking is allowed in Atlantic City. 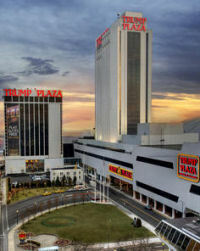 See the Atlantic City casino map to find locations, information on golf packages and RV parking. We recommend you take the 24-Hour Jitney service for transportation between casinos. The cost is $2 per person. You never have to wait more than 5 minutes and it even goes to the marina area. 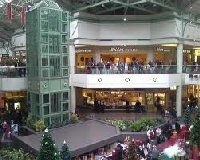 New Jersey's official travel site for more information about visiting Atlantic City. You may also enjoy learning about other casinos worldwide or visiting famous U.S. gambling cities and if you visit Las Vegas discover the different attractions and exhibits, many or which are free. Casinos near major U.S. cities menu. Meadowlands East Rutherford Meadowlands Race Track in East Rutherford, New Jersey has two harness racing tracks with races through August 21 and Post time is 7pm Wednesday - Saturday. Freehold Freehold Freehold Raceway in Freehold, New Jersey has a 1/2 mile track that features live Standardbred harness races for trotters and pacers from August through early June. The racetrack is also open seven days a week and seven nights for year round thoroughbred and harness racing simulcasts from tracks. Atlantic City Mays Landing Atlantic City Racetrack has thoroughbred races and is open daily 11am-11pm for wagering on national simulcast races. Monmouth Oceanport Monmouth Park in Oceanport, New Jersey offers live thoroughbred racing May 22 until Labor Day on Friday - Sunday, post time 12:50 and open daily for simulcast wagering on national races.